Who really likes the boring history books? Who would rather sit down with a good book, and when you are done realize that you have just completed a good history unit? I know which one I like better! 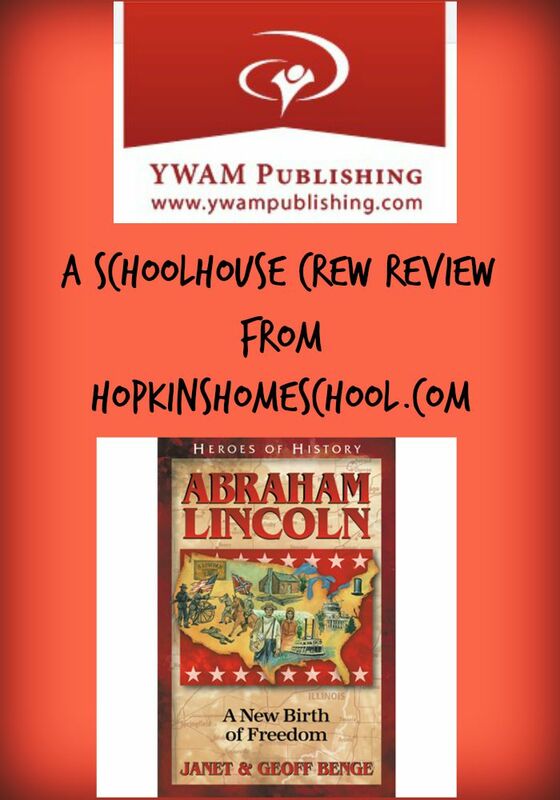 YWAM Publishing has some great titles in their Heroes of History Series, but I can’t wait to tell you more about Abraham Lincoln: A New Birth of Freedom and the Unit Study Curriculum Guide that goes along with the book. 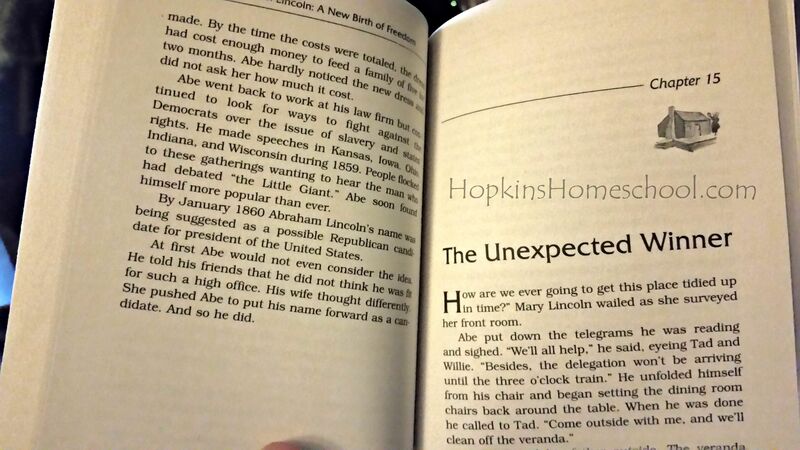 This softcover 218 page book is the life story of Abraham Lincoln. Now this isn’t a boring history book telling of Abraham Lincoln, it is not even a long drawn out biography. This is a story of Abraham Lincoln. This is written in an easy to understand and even easier to enjoy format. While the book itself is just a history story, when you add in the Unit Study Curriculum Guide, you now have yourself a perfect Unit Study on Abraham Lincoln! The first thing that happened in our house when I opened the package and found this book, was it disappeared! Every child wanted to see the book on Abraham Lincoln. He is a favorite guy in this house! After mom finally got it back, it was time to figure out how we were going to use this. There are many different options when it comes to these books. Simply collect the books and let your children read, or you read aloud to them. The next would be to utilize the Unit Study option and turn this book into a great way to learn. We did the second! The Unit Study Curriculum Guide has many wonderful options! It was hard to pick and choose what we wanted to use, knowing that using them all would stress my kids out. I decided that each child would pick one of the key quotes listed and study that during this whole book. They took their quote and they used it for handwriting practice and memorization. We even looked into learning more about each quote, when and where it was said and the true meaning of it. The chapter questions that were provided were a perfect way to see what the children remembered from my reading to them. There were only 4 for each chapter and they each are the same type for all the chapters. I loved how this was like this because I could rotate the questions between the kids while knowing that they would have a different type the next day. We also used the ideas for Essay Questions and Creative writing. This is a tough subject in our house, so whenever I find good ideas on topics the kids love, we go overboard! All while still having fun! While Moe Man enjoyed the creative writing ideas better, he was still able to easily work on the essay questions. The best part? Mom choose how long they had to be instead of the writing in the book saying so. I could decide what needed more or what needed less writing. Wow! I never knew that a book so good, could actually be so full of learning and yet have the kids enjoy it! I loved every minute of reading this book. I was able to read it out loud with no problems, no boredom for me, so I had more fun reading it! The kids didn’t want me to stop. They didn’t care that it was a “school” book, all they cared about was how good it was. The Unit Study Curriculum Guide was so full of fun and learning, I loved it! It was not overwhelming since it was broken down so nicely by chapter. There were so many different levels of learning included, that no matter who your child is, you will find something that will help them take the book and use it for school. YWAM Publishing has so many different books in this series you are sure to find what you are looking for. Hop on over and see some more of them by reading these other reviews!